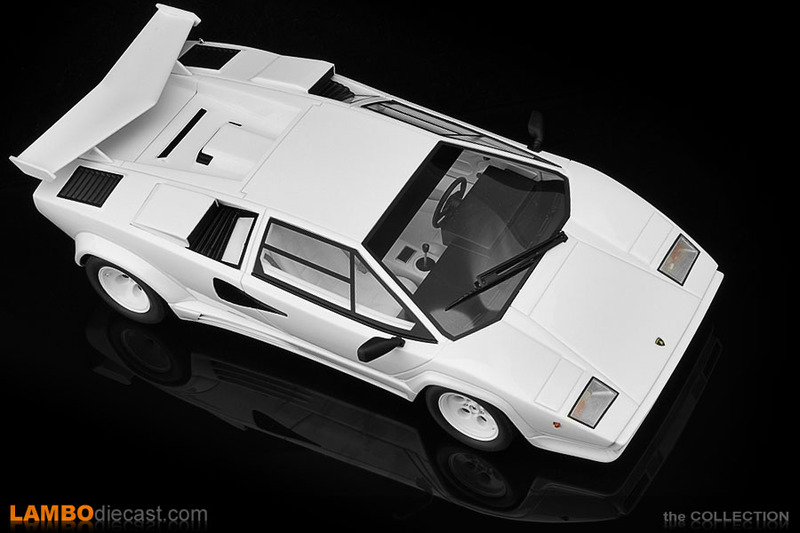 In 1985 Lamborghini presented their answer to Ferrari's Testarossa, the Countach Quattrovalvole, a V12 four-valve 5.2 liter Bull with 455 bhp being put onto the rear wheels only, massive 345/35-15 Pirelli P7 tires on those trademark 'telephone dial' wheels we all love on the Countach. 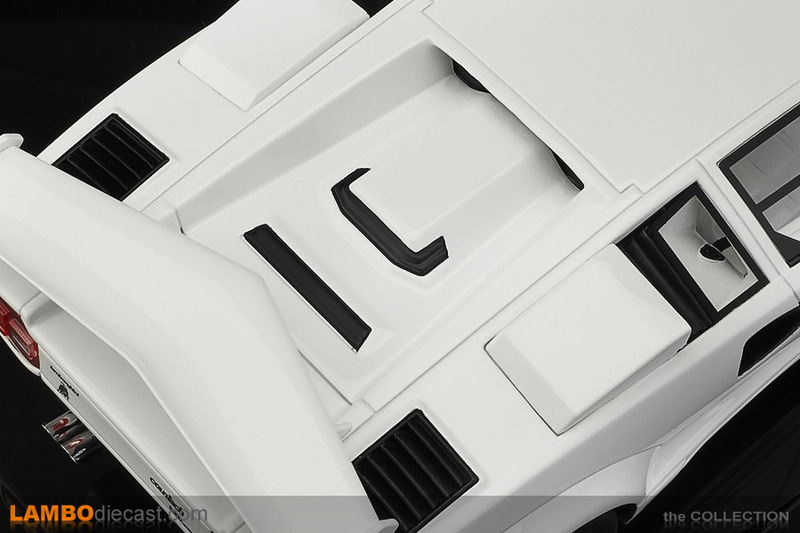 Rear visibility was already low in the Countach LP500 S, but with the vertical Weber carburettors a new engine cover was needed with a 'hump' in the middle ... so rear visibility was as good as non-existent on the Countach QV, reversing into a parking spot required the driver to open the door, sit on the side sill and look backward while operating the clutch. 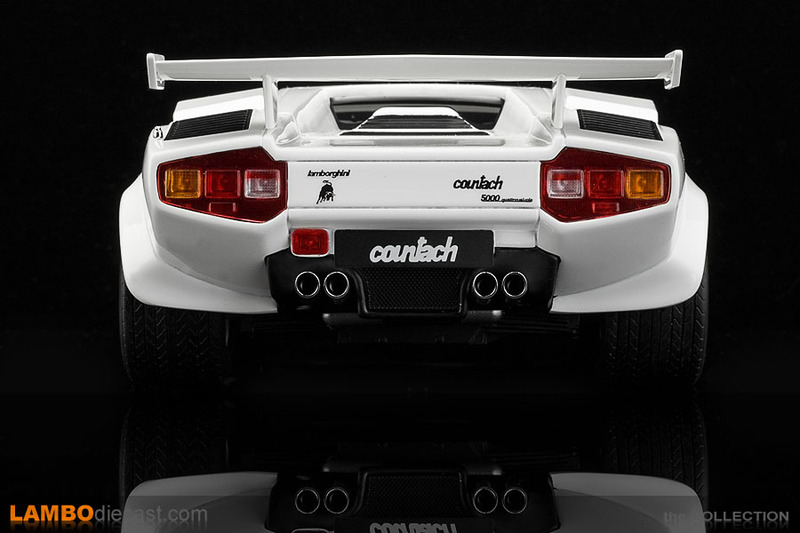 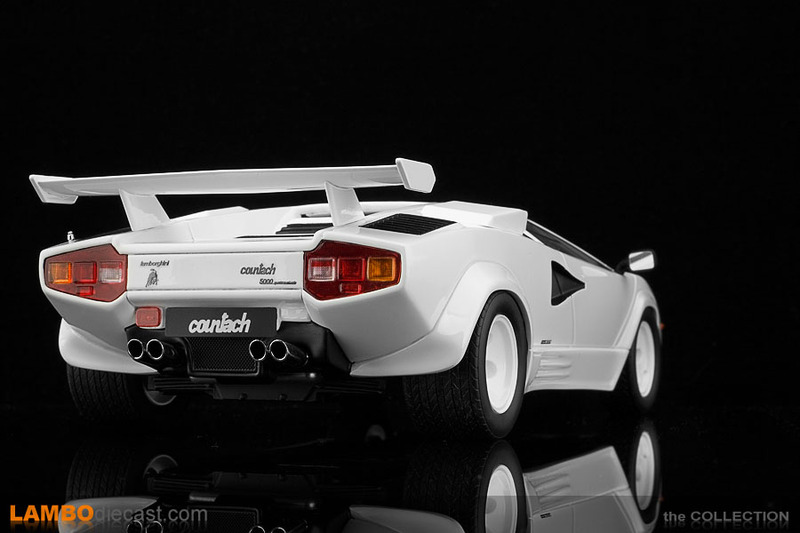 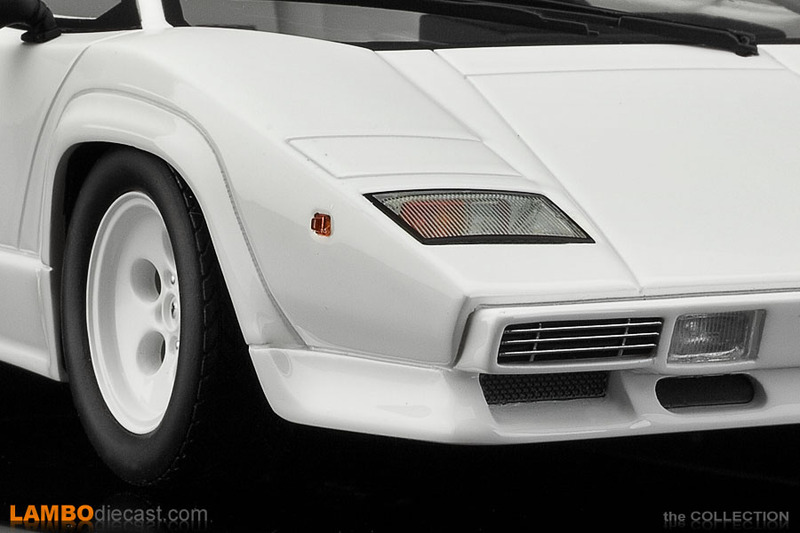 Note that the US specs Lamborghini Countach QV (made from 1986 on) had the carburetor replaced by a Bosch KR-Jetronic fuel injection, this lowered the power output to 420 bhp and came with a special engine cover with two 'humps' on either side ... most US specs Countach QV also came with hideous black front bumpers and four large, black rear bumper blocks to comply with US laws at that time. 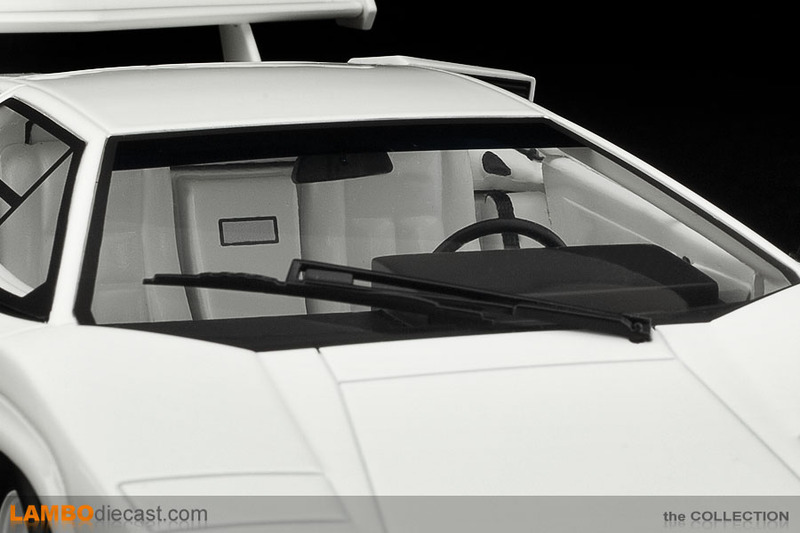 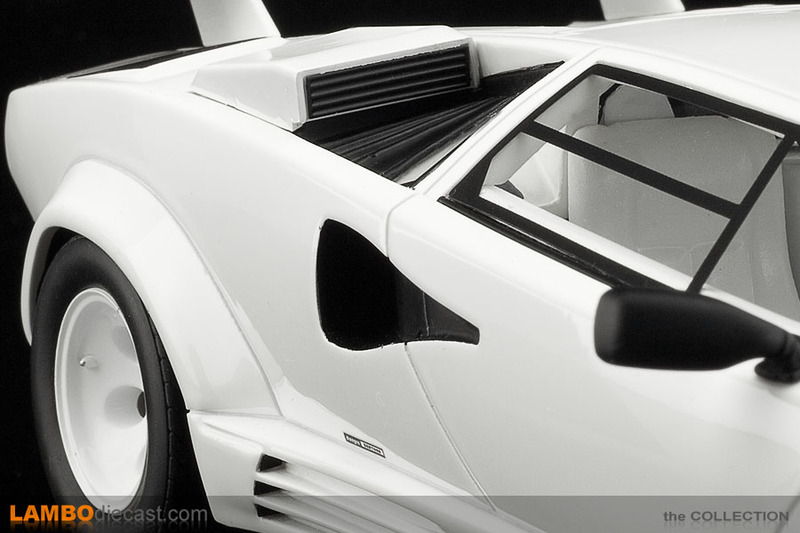 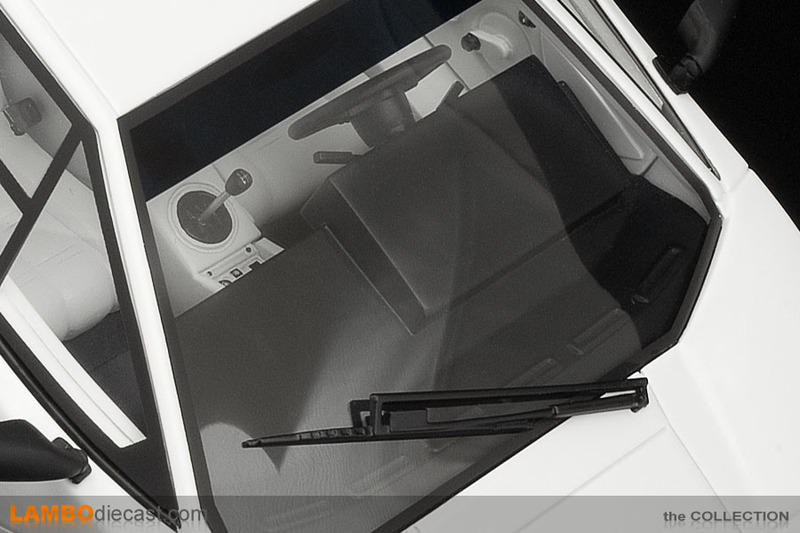 In late 1987 the exterior of the Countach QV received new side sills with a 'streaked' intake design, something that would later be seen on the 25th Anniversary edition too, on the inside a central-locking system was installed together with modified heater controls on the central console ... at about $5,000 back in 1987, the massive rear wing was still an option, but due to the increased drag it actually lowered the top speed on the Countach. 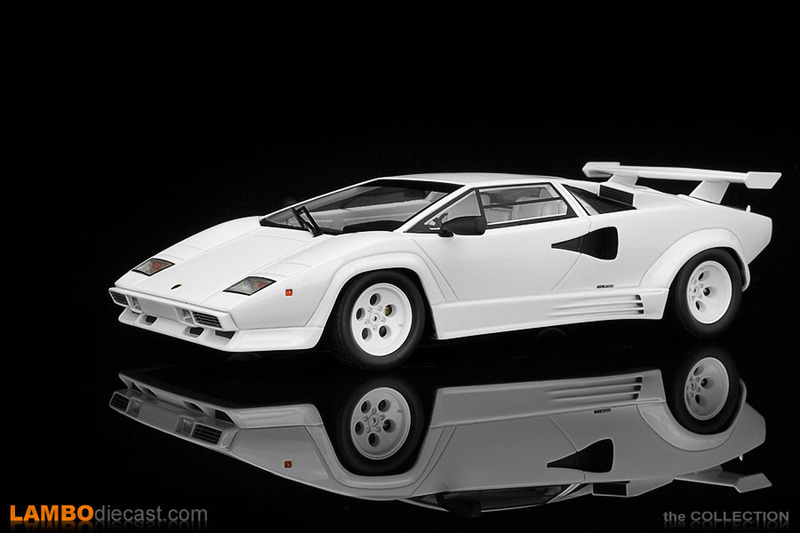 This 1/18 scale model of the Lamborghini Countach Quattrovalvole made by GT Spirit/Kyosho is, in fact, a replica of the European specs 1988 1/2 model, so the one with the special side sills (despite being built from late 1987 on these specific models are known as 88 1/2) ... but there is a small issue with this ... the side sills clearly make this a late model Countach QV (although some older Countach also received these side sills I have been told) but taking a closer look at the central console shows the 'old' style controls ... if this is an 88 1/2 model with the side sills, it should also have the later model airconditioning controls ... but I wouldn't be surprised of Lamborghini actually built a few late model Quattrovalvole with these side sills and the old controls. 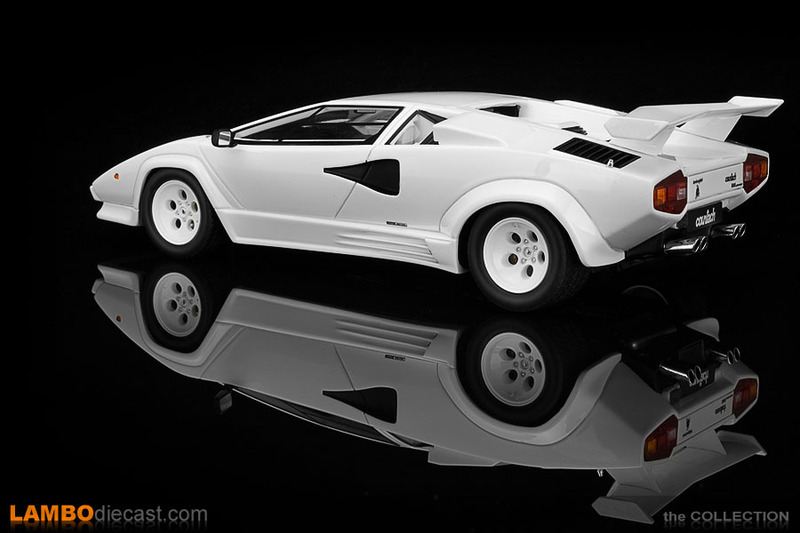 At first I wasn't going to buy this GT Spirit/Kyosho scale model because I already own a nice 1/18 Lamborghini Countach Quattrovalvole, the Smurfs blue one from Kyosho, made many years ago as an all-opening diecast, and I didn't have the best experiences with the quality on some of my earlier GT Spirit models ... but when I saw this one listed for a decent price, and I still received a nice discount, I couldn't resist and bought it anyway so I could put it next to my white on white Lamborghini Countach LP500 S by Kyosho. 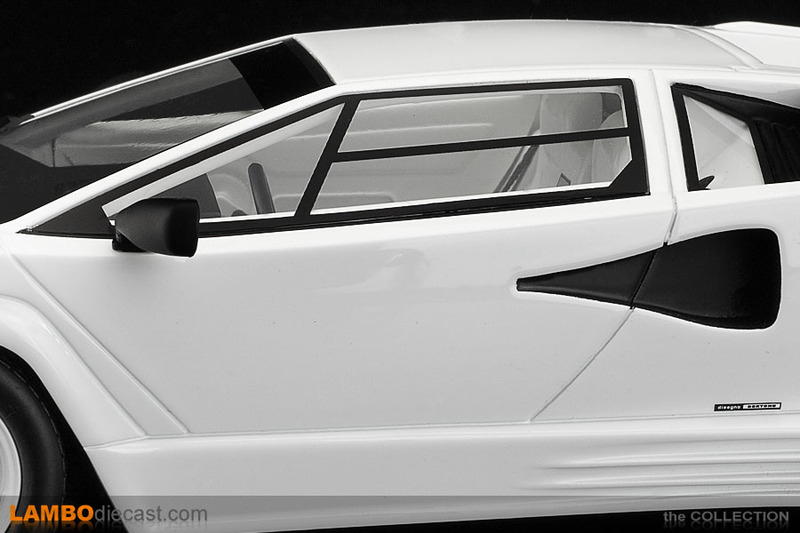 When I opened the box I admit I was a bit anxious ... but this model has no issues, there is no quality issue on this one, she sits on all four wheels in my display, and upon closer inspection I was really surprised by the attention to detail GT Spirit/Kyosho did on this model ... they even included the antenna on the rear fender, I love it. 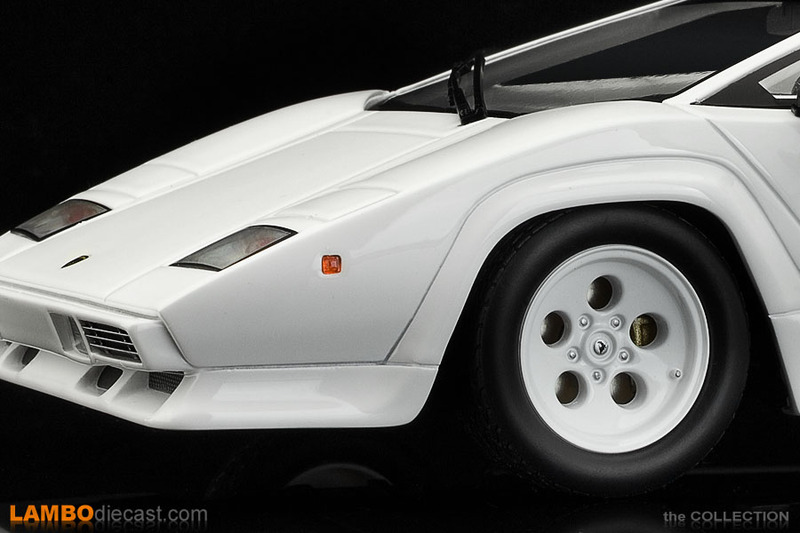 As usual the sides of the tires don't show any make, but if you look at the thread of these wide tires they are actually correct for the Pirelli P7 that was used in real life, the wheels are painted in white on this model to match the bodywork, now that was a popular option on the earlier LP500 S but on the QV this wasn't asked a lot anymore, still I can live with this. 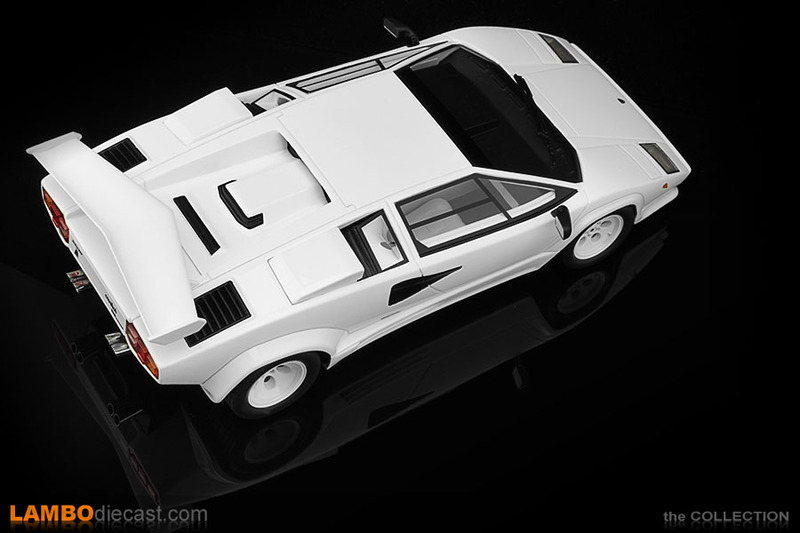 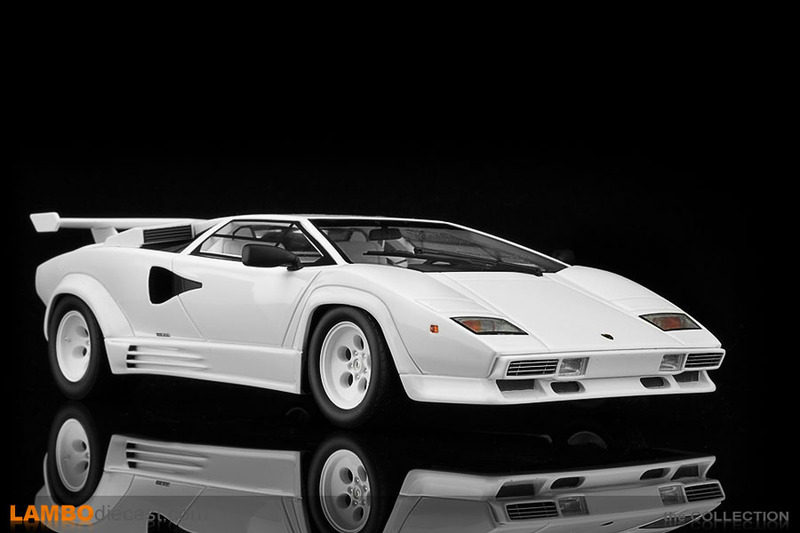 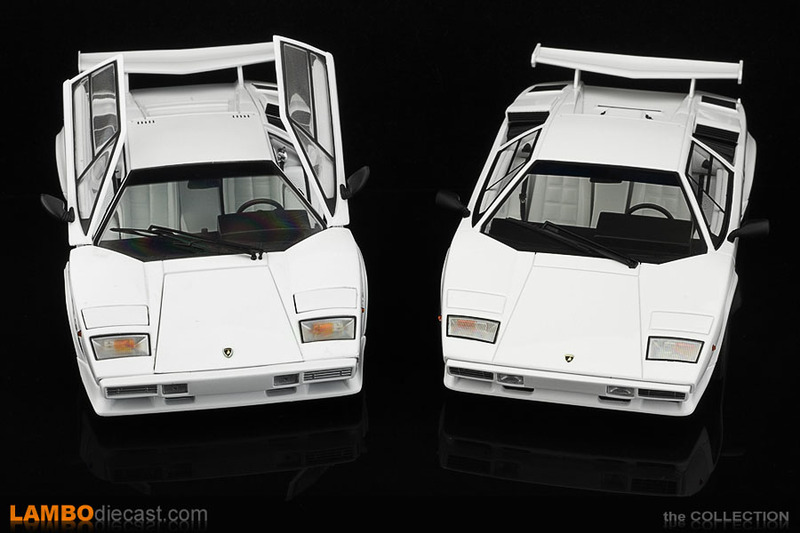 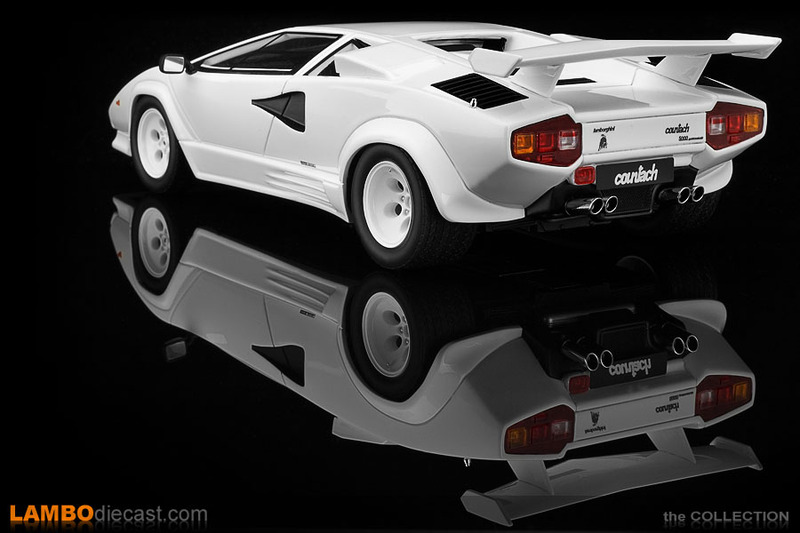 Note that the Kosho version was finished in red and came with silver wheels ... but also with a red interior ... and a red Countach with a red interior just didn't tempt me as much as this triple white version from GT Spirit. 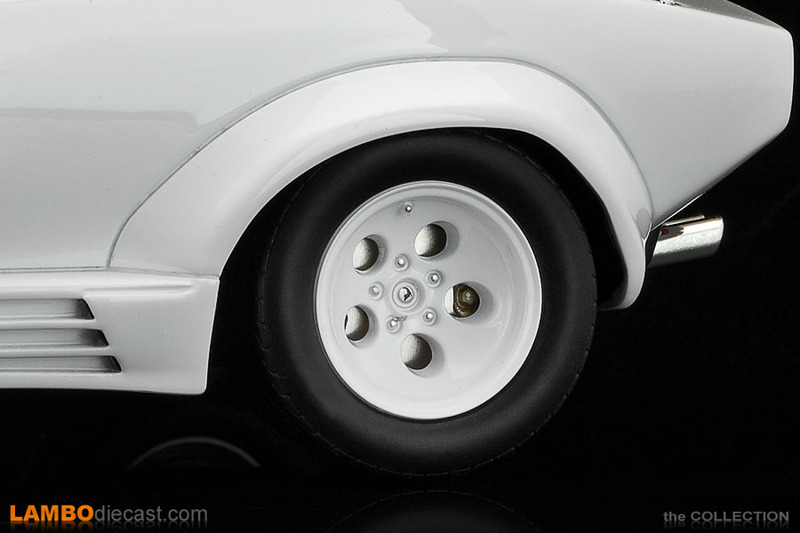 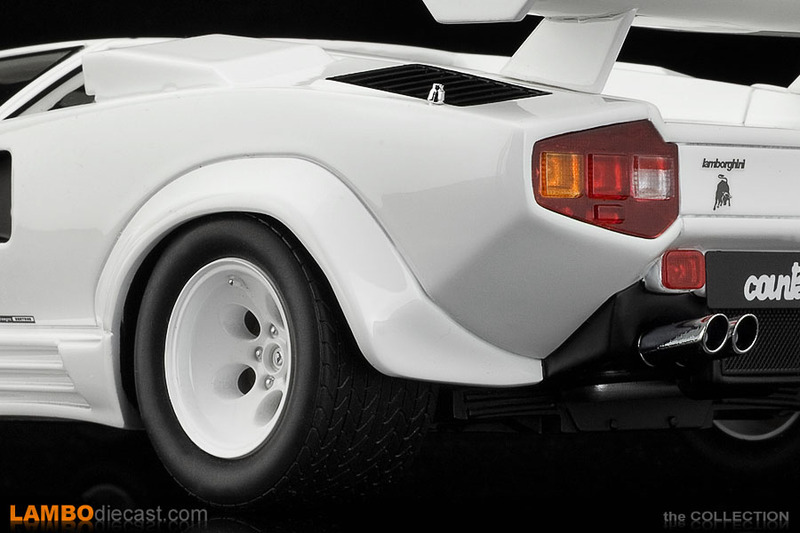 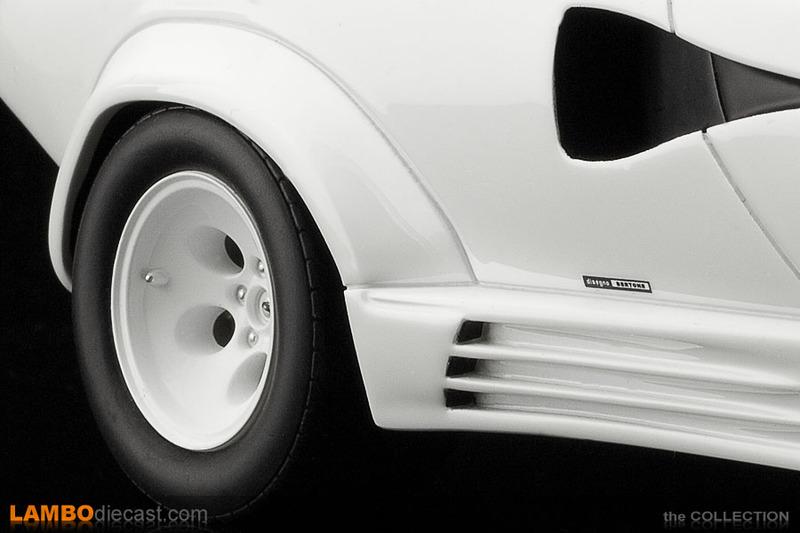 You can even see the brake calipers behind these Countach wheels, and the biggest mistake GT Spirit made on their Countach Koenig model (the intakes on the doors) has been corrected on this Quattrovalvole model, I actually think they used a different mold for this model, it looks too different. 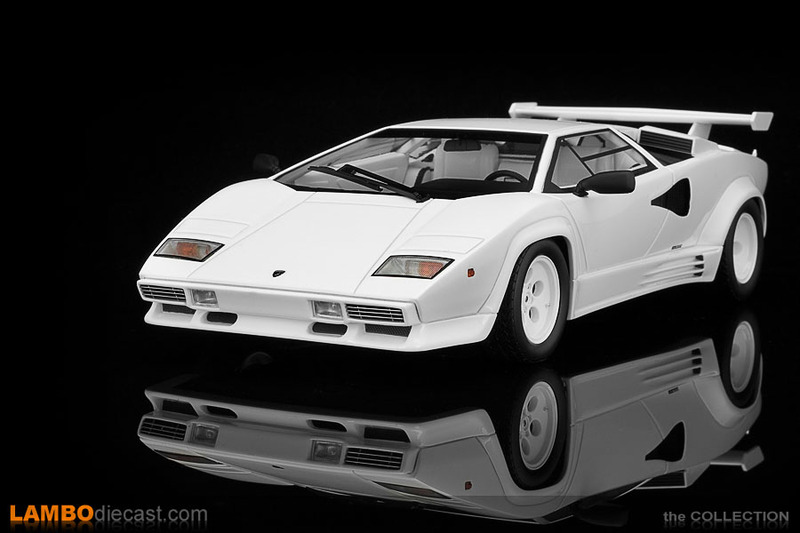 I really like this model, I didn't think I would love it as much as I do, hence I'm happy I did add it to my collection, there is one detail that seems a bit strange to me ... when I compare this one to my 1/18 Countach LP500 S from Kyosho it seems the front fenders on the GT Spirit model are more curved inward to result in a small front bumper ... now I've been studying photos of real Countach for a while, and some do really show such a curved design ... could the old Kyosho be wrong and this new GT Spirit correct? 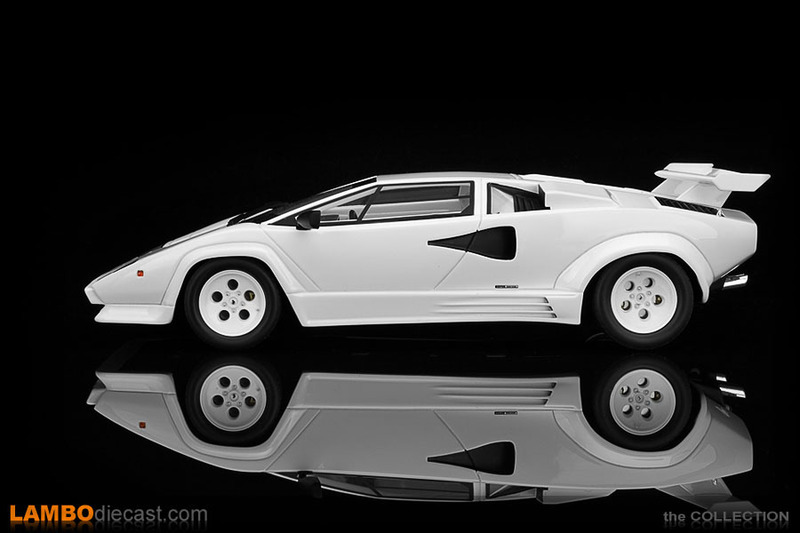 I don't know, and I'm not going to pass judgement on that for now, next to all the other Countach I have in 1/18 scale from AUTOart and Kyosho this one looks 'different' with that front, but still I really love my new Quattrovalvole, and if you can still find one for sale (this was a limited edition model) I would buy it, I think these will become more valuable over time.